Jayashree offers a complete solution with a brushless servo motor, encoder, AC vector control servo drive and optional brake in 30 W – 3000 W range. We work with OEMs to design and deliver a solution that meets their electrical and mechanical design specification. 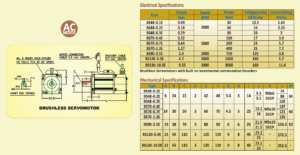 Click here for the JEDL Servo Motors Data Sheet. High Rated Speed up to 12,000rpm. State-of-the-art, closed-loop, AC vector servo gives you smooth, quiet and repeatable motion and control of position, speed & torque in any direction. Integrated low voltage servo drive & motor offers a very compact solution to many motion control problems in a wide variety of applications such as packaging, diamond cutting & polishing, embroidery machines, wood working machines, etc. Simply provide 48/60 V DC power along with pulse & direction signals to operate and control the motor. Eliminates unnecessary cables and clutter inside the machines and a separate panel to house the drives is no longer required. Jayashree servo motors deliver great performance due to their compact size and characteristics of high peak torque, high continuous torque and high rated speed— with a low cogging torque. High peak torque is achieved by using sintered Neodymium-Iron-Boron permanent magnets—not plastic-bonded Neodymium—and by optimizing all design parameters. High continuous torque requires a motor that can manage heat. Tightly filled stator windings are designed to avoid build up of hot spots in the motor. The thermal design ensures even and easy heat dissipation. The Class-H (180ºC-rated) winding insulation protects the motor during long operating cycles, and there is no significant deterioration of the magnetic properties of its sintered rare earth magnets. Jayashree servo motors show a flat torque curve over a wide range of speeds. Many brushless motors have the problem of a high cogging or detent torque (Detent torque is the amount of torque that must be applied to a motor to overcome the static (magnetic) equilibrium of the motor when it is in an unpowered state of rest). They also often have significant distortion in their back-EMF signature which leads to high torque ripple. Jayashree brushless servo motors are designed for smooth operation with a low cogging / detent torque and a linear, low-ripple torque output. Each rotor is individually balanced for a smooth performance at all speeds. High quality sealed ball bearings complement the other design features to make a high performing motor. We are looking for distributors in Asia Pacific, former Soviet Republics and South America. We are looking for distributors in Asia Pacific, former Soviet Republics and South America. Contact us.